Describe the significance of the ocean and how it influences weather and climate. Explain the different layers of the ocean. Understand the basic physics of ocean waves. Compare and contrast the differences between surface and deep ocean currents. The oceans make up 70 percent of the planet and contains 97 percent of all the water on Earth. It also makes up the vast majority of water stores the majority of the planet's moisture, terrestrial energy, and heat from the Sun. This energy is transferred between the equator and the two poles by larger surface currents by winds and deep ocean currents driven by differences in ocean density. It also provides the moisture and energy for storm systems and ultimately global climates. Phytoplankton, microscopic plants and animals in the oceans provide the foundation of the global food web of species. The earth's oceans are so vital for life that over 40 percent of the world's population live near coastal areas. The Blue Marble, captured by NASA in 2001. 70 percent of the planet is water. As terrestrial creatures, humans think of the importance of the planet’s land surfaces, yet Earth is a planet consisting of 70 percent water. From space, the dominance of water is obvious because most of it is stored in Earth's oceans. Earth would not be the same planet without its oceans. The oceans, along with the atmosphere, keep Earth's surface temperatures fairly constant worldwide. Some places on Earth reach as cold as -7 degrees Celsius, whereas other places reach as hot as 55 degrees Celsius. Yet on other planets like Mercury, temperatures range from -180 degrees Celsius to 430 degrees Celsius. The oceans, along with the atmosphere, distribute heat around the planet. The oceans absorb heat near the equator and then transport that solar energy to polar regions. The oceans also moderate climate within a region. At the same latitude, the temperature range is smaller along coastal areas compared to areas farther inland. Along coastal areas, summer temperatures are not as hot, and winter temperatures are not as cold, because water takes a long time to heat up or cool down. The oceans are an essential part of Earth’s water cycle. Since they cover so much of the planet, most evaporation comes from the ocean and most precipitation falls on the oceans. The oceans are also home to an enormous amount of life. That is, they have tremendous biodiversity. Tiny ocean plants create the base of a food web that supports all sorts of life forms. Marine life makes up the majority of all biomass on Earth. (Biomass is the total mass of living organisms in a given area.) These organisms supply us with food and even the oxygen created by marine plants. Recall from the chapter on Plate Tectonics that the ocean floor is not flat. 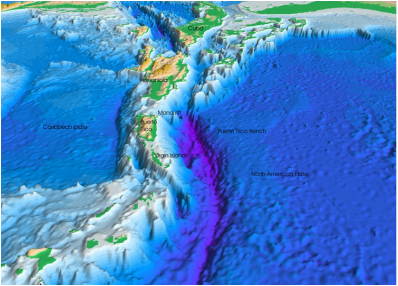 Mid-ocean ridges, deep sea trenches, and other features all rise sharply above or plunge deeply below the abyssal plains. In fact, Earth’s tallest mountain is Mauna Kea volcano, which rises 10,203 m (33,476 ft.) from the Pacific Ocean floor to become one of the volcanic mountains of Hawaii. The deepest canyon is also on the ocean floor, the Challenger Deep in the Marianas Trench, 10,916 m (35,814 ft). The mapping of the ocean floor and coastal margins is called bathymetry. The continental margin is the transition from the land to the deep sea or, geologically speaking, from continental crust to oceanic crust. More than one-quarter of the ocean basin is continental margin. Average composition of the ocean. Water is a polar molecule so it can dissolve many substances such as salts, sugars, acids, bases, and organic molecules. Where does the salt in seawater come from? As water moves through rock and soil on land it picks up ions. This is the flip side of weathering. Salts comprise about 3.5 percent of the mass of ocean water, but the salt content or salinity is different in different locations. In places like estuaries, seawater mixes with fresh water, causing salinity to be much lower than average. Where there is lots of evaporation but little circulation of water, salinity can be much higher. The Dead Sea has 30 percent salinity - nearly nine times the average salinity of ocean water. It is called the Dead Sea because nearly nothing can survive within it because of its salinity. Earthquide has an interactive ocean maps, which can show salinity, temperature, nutrients, and other characteristics. Differences in water density are responsible for deep ocean currents. With so many dissolved substances mixed in seawater, what is the density (mass per volume) of seawater relative to fresh water? Water density increases as: salinity increases; temperature decreases; pressure increases. In 1960, two men in a specially designed submarine called the Trieste descended into a submarine trench called the Challenger Deep (10,910 meters). The average depth of the ocean is 3,790 m, a lot more shallow than the deep trenches but still an incredible depth for sea creatures to live in. There are three major factors that make the deep ocean hard to inhabit: the absence of light, low temperature, and extremely high pressure. To better understand regions of the ocean, scientists define the water column by depth. They divide the entire ocean into two zones vertically, based on light level. Large lakes are divided into similar regions. Sunlight only penetrates the sea surface to a depth of about 200 m, creating the photic zone (consisting of the Sunlight Zone and Twilight Zone). Organisms that photosynthesize depend on sunlight for food and so are restricted to the photic zone. Since tiny photosynthetic organisms, known as phytoplankton, supply nearly all of the energy and nutrients to the rest of the marine food web, most other marine organisms live in or at least visit the photic zone. In the aphotic zone (consisting of the Midnight Zone and the Abyss) there is not enough light for photosynthesis. The aphotic zone makes up the majority of the ocean, but has a relatively small amount of its life, both in diversity of type and in numbers. The seabed is also divided into the zones described above, but the ocean itself is also divided horizontally by distance from the shore. Nearest to the shore lies the intertidal zone, the region between the high and low tidal marks. This hallmark of the intertidal is change, where water is in constant motions from ocean waves, tides, and currents. The land is sometimes under water and sometimes is exposed. The neritic zone is from low tide mark and slopes gradually downward to the edge of the seaward side of the continental shelf. Some sunlight penetrates to the seabed here. The oceanic zone is the entire rest of the ocean from the bottom edge of the neritic zone, where sunlight does not reach the bottom. Ocean water is constantly in motion: north-south, east-west, alongshore, and vertically. Seawater motions are the result of waves, tides, and currents. Ocean movements are the consequence of many separate factors: wind, tides, Coriolis effect, water density differences, and the shape of the ocean basins. Waves have been discussed in previous chapters in several contexts: seismic waves traveling through the planet, sound waves traveling through seawater, and ocean waves eroding beaches. Waves transfer energy and the size of a wave and the distance it travels depends on the amount of energy that it carries. Ocean waves originate from steady winds or high storm winds over the water. Sometimes these winds are far from where the ocean waves are seen. The largest wind waves form when the wind is very strong, blows steadily for a long time, and blows over a long distance. The wind could be strong, but if it gusts for just a short time, large waves won’t form. Wind blowing across the water transfers energy to that water. The energy first creates tiny ripples that create an uneven surface for the wind to catch so that it may create larger waves. These waves travel across the ocean out of the area where the wind is blowing. Remember that a wave is a transfer of energy. Water molecules in waves make circles or ellipses. Energy transfers between molecules but the molecules themselves mostly bob up and down in place. The Internet has a variety of animations to help explain the concept of wave action. In this animation, a water bottle bobs in place like a water molecule. An animation of motion in wind waves from the Scripps Institution of Oceanography. Here is an animation of a deep water wave is seen here. Notice the circular motion of water as wave energy transfers through it. Compare that to the wave action in shallow waters using this animation. Waves break when they become too tall to be supported by their base. This can happen at sea but happens predictably as a wave moves up a shore. The energy at the bottom of the wave is lost by friction with the ground so that the bottom of the wave slows down but the top of the wave continues at the same speed. The crest falls over and crashes down. Some of the damage done by storms is from storm surges. Water piles up at a shoreline as storm winds push waves into the coast. Storm surge may raise sea level as much as 7.5 m (25 ft), which can be devastating in a shallow land area when winds, waves, and rain are intense. Tsunami are described in the Tectonic Forces chapter as damaging waves that result from the sharp jolt to the water from a powerful geologic event such as undersea earthquakes or volcanic eruptions. Landslides, meteorite impacts, or any other jolt to ocean water may form a tsunami. Tsunami can travel at speeds of 800 kilometers per hour (500 miles per hour). Tsunami have small wave heights and long wavelengths so they are usually unnoticed at sea. As the wave rides up the continental shelf the wave height increases. The wave speed of a tsunami is also slowed by friction with the shallower ocean floor, which causes the wavelength to decrease, creating a much taller wave called a run-up. Many people caught in a tsunami have no warning of its approach. Since the wavelength is long, a long time can pass between crests or troughs onshore. In 1755 in Lisbon, an offshore earthquake caused a great deal of damage on land. People rushed to the open space of the shore and discovered that the water was flowing seaward fast. The trough of the tsunami wave reached shore first. People who went out onto the open beach were drowned when the crest of the wave reached shore. Tides are the daily rise and fall of sea level at any given place. The pull of the Moon’s gravity on Earth is the primarily cause of tides and the pull of the Sun’s gravity on Earth is the secondary cause. The Moon has a greater effect because, although it is much smaller than the Sun, it is much closer. The Moon’s pull is about twice that of the Sun’s. To understand the tides it is easiest to start with the effect of the Moon on Earth. As the Moon revolves around our planet, its gravity pulls Earth toward it. The lithosphere is unable to move much but the water above it is pulled by the gravity and a bulge is created. This bulge is the high tide beneath the Moon. The Moon's gravity then pulls the Earth toward it, leaving the water on the opposite side of the planet behind. This creates a second high tide bulge on the opposite side of Earth from the Moon. These two water bulges on opposite sides of the Earth aligned with the Moon are the high tides. Click here to learn more. Since so much water is pulled into the two high tides, low tides form between the two high tides. As the Earth rotates beneath the Moon, a single spot will experience two high tides and two low tides every day. The tidal range is the difference between the ocean level at high tide and the ocean at low tide. The tidal range in a location depends on a number of factors, including the slope of the seafloor. Water appears to move a greater distance on a gentle slope than on a steep slope. Waves are additive so when the gravitational pull of the Sun and Moon are in the same direction, the high tides add and the low tides add. Highs are higher and lows are lower than at other times through the month. These more extreme tides, with a greater tidal range, are called spring tides. Spring tides don't just occur in the spring; they occur whenever the Moon is in a new-moon or full-moon phase, about every 14 days. The National Oceanic and Atmospheric Administration (NOAA) has a simple diagram of this process. Neap tides are tides that have the smallest tidal range, and they occur when the Earth, the Moon, and the Sun form a 90 degree angle. They occur exactly halfway between the spring tides, when the Moon is at first or last quarter. How do the tides add up to create neap tides? The Moon's high tide occurs in the same place as the Sun's low tide and the Moon's low tide in the same place as the Sun's high tide. At neap tides, the tidal range relatively small. Here is another simple animation of spring and neap tides from NOAA. High tides occur about twice a day, about every 12 hours and 25 minutes. The reason is that the Moon takes 24 hours and 50 minutes to rotate once around the Earth so the Moon is over the same location 24 hours and 50 minutes later. Since high tides occur twice a day, one arrives each 12 hours and 25 minutes. What is the time between a high tide and the next low tide? This animation shows the effect of the Moon and Sun on the tides. Some coastal areas do not follow this pattern at all. These coastal areas may have one high and one low tide per day or a different amount of time between two high tides. These differences are often because of local conditions, such as the shape of the coastline that the tide is entering. Ocean water moves in predictable ways along the ocean surface. Surface currents can flow for thousands of kilometers and can reach depths of hundreds of meters. These surface currents do not depend on weather; they remain unchanged even in large storms because they depend on factors that do not change. Surface currents are created by three things: global wind patterns, the rotation of the Earth, and the shape of the ocean basins. Surface currents are extremely important because they distribute heat around the planet and are a major factor influencing climate around the globe. Wind is not the only factor that affects ocean currents. The Coriolis effect describes how Earth’s rotation steers winds and surface ocean currents. The Coriolis effect causes freely moving objects to appear to move to the right in the Northern Hemisphere and to the left in the Southern Hemisphere. The objects themselves are actually moving straight, but the Earth is rotating beneath them, so they seem to bend or curve. An example might make the Coriolis effect easier to visualize. If an airplane flies 500 miles due north, it will not arrive at the city that was due north of it when it began its journey. Over the time it takes for the airplane to fly 500 miles, that city moved, along with the Earth it sits on. The airplane will therefore arrive at a city to the west of the original city (in the Northern Hemisphere), unless the pilot has compensated for the change. So to reach his intended destination, the pilot must also veer right while flying north. As wind or an ocean current moves, the Earth spins underneath it. As a result, an object moving north or south along the Earth will appear to move in a curve, instead of in a straight line. Wind or water that travels toward the poles from the equator is deflected to the east, while wind or water that travels toward the equator from the poles gets bent to the west. The Coriolis effect bends the direction of surface currents to the right in the Northern Hemisphere and left in the Southern Hemisphere. When a surface current collides with land, the current must change direction. In the figure below, the Atlantic South Equatorial Current travels westward along the equator until it reaches South America. Near Brazil, some of it goes north and some goes south. Because of Coriolis effect, the water goes right in the Northern Hemisphere and left in the Southern Hemisphere. You can see on the map below the major surface ocean currents that the surface ocean currents create loops called gyres. The Antarctic Circumpolar Current is unique because it travels uninhibited around the globe. Why is it the only current to go all the way around? The surface currents described above are all large and unchanging. Local surface currents are also found along shorelines. Two are long shore currents and rip currents. Rip currents are potentially dangerous currents that carry large amounts of water offshore quickly. Look at the rip-current animation to determine what to do if you are caught in a rip current. Each summer in the United States at least a few people die when they are caught in rip currents. Surface currents play an enormous role in Earth’s climate. Even though the equator and poles have very different climates, these regions would have more extremely different climates if ocean currents did not transfer heat from the equatorial regions to the higher latitudes. The Gulf Stream is a river of warm water in the Atlantic Ocean, about 160 kilometers wide and about a kilometer deep. Water that enters the Gulf Stream is heated as it travels along the equator. The warm water then flows up the east coast of North America and across the Atlantic Ocean to Europe. The energy the Gulf Stream transfers is enormous: more than 100 times the world's energy demand. The Gulf Stream's warm waters raise temperatures in the North Sea, which raises the air temperatures over land between 3 to 6 degrees C (5 to 11 degrees F). London, U.K., for example, is at the same latitude as Quebec, Canada. However, London’s average January temperature is 3.8 degrees C (38 degrees F), while Quebec’s is only -12 degrees C (10 degrees F). Because air traveling over the warm water in the Gulf Stream picks up a lot of water, London gets a lot of rain. In contrast, Quebec is much drier and receives its precipitation as snow. Red arrows indicate surface water currents and blue arrows indicate deep water currents. Thermohaline circulation drives deep ocean circulation. Thermo means heat and haline refers to salinity. Differences in temperature and in salinity change the density of seawater. So thermohaline circulation is the result of density differences in water masses because of their different temperature and salinity. What is the temperature and salinity of very dense water? Lower temperature and higher salinity yield the densest water. When a volume of water is cooled, the molecules move less vigorously so same number of molecules takes up less space and the water is denser. If salt is added to a volume of water, there are more molecules in the same volume so the water is denser. Changes in temperature and salinity of seawater take place at the surface. Water becomes dense near the poles. Cold polar air cools the water and lowers its temperature, increasing its salinity. Fresh water freezes out of seawater to become sea ice, which also increases the salinity of the remaining water. This very cold, very saline water is very dense and sinks. This sinking is called downwelling. Two things then happen. The dense water pushes deeper water out of its way and that water moves along the bottom of the ocean. This deep water mixes with less dense water as it flows. Surface currents move water into the space vacated at the surface where the dense water sank. Water also sinks into the deep ocean off of Antarctica. Since unlimited amounts of water cannot sink to the bottom of the ocean, water must rise from the deep ocean to the surface somewhere. This process is called upwelling. Generally, upwelling occurs along the coast when wind blows water strongly away from the shore. This leaves a void that is filled by deep water that rises to the surface. Upwelling is extremely important where it occurs. During its time on the bottom, the cold deep water has collected nutrients that have fallen down through the water column. Upwelling brings those nutrients to the surface. Those nutrient support the growth of plankton and form the base of a rich ecosystem. California, South America, South Africa, and the Arabian Sea all benefit from offshore upwelling. Upwelling also takes place along the equator between the North and South Equatorial Currents. Winds blow the surface water north and south of the equator so deep water undergoes upwelling. The nutrients rise to the surface and support a great deal of life in the equatorial oceans. Bathymetric map of the Puerto Rico trench. Oceanographers like to say that we know more about the dark side of the Moon than we do about the oceans. That statement is doubly true of the seafloor. Although modern technology has allowed us to learn more about the seafloor, vast regions remain unexplored. Scuba divers can only dive to about 40 meters and they cannot stay down there for very long. Although this is good for researching the organisms and ecosystems very near a coast, most oceanic research requires accessing greater depths. In the Plate Tectonics chapter, you learned that echo sounders designed to locate enemy submarines allowed scientists to create bathymetric maps of the seafloor. Prior to this advance, explorers mapped a small amount of the seafloor by painstakingly dropping a line over the side of a ship to measure the depth at one tiny spot at a time. Samples of seawater from different depths in the water column are needed to understand ocean chemistry. To do this bottles are placed along a cable at regular depths and closed as a weight is dropped down the cable. The water trapped in the bottle can be analyzed later in a laboratory. Scientists are also interested in collecting rock and sediment samples from the seafloor. A dredge is a giant rectangular bucket that is dragged along behind a ship to collect loose rocks. Gravity corers are metal tubes that fall to the seafloor and slice into the sediments to collect a sample. The research vessel, the Joides Resolution, drills deep into the seafloor to collect samples of the sediment and ocean crust. Scientists analyze the samples for chemistry and paleomagnetism. To avoid the expense, dangers, and limitations of human missions under the sea, remotely operated vehicles or ROV’s, allow scientists to study the ocean’s depths by using small vehicles carrying cameras and scientific instruments. ROVs were used to study the Titanic, which would have been far too dangerous for a manned sub to enter. Scientists control ROVs electronically with sophisticated operating systems. The ocean provides important living and nonliving resources. To be maintained for future use, these resources must be managed sustainably. Most fish are caught by lines or nets as they swim in the open waters of the ocean. Some species of fish are being over-harvested, which means their rate of reproduction cannot keep up with the rate at which people consume them. Bottom trawling is a method of fishing that involves towing a weighted net across the seafloor to harvest fish. In many areas where bottom trawling is done, ecosystems are severely disturbed by the large nets. For this reason, in a few areas in the world, laws limit bottom trawling to waters not more than 1,000 m deep or waters far from protected and sensitive areas. Still these actions protect some of the seafloor. Besides food, ocean organisms have other uses. Some provide us with medications. Oil and natural gas are the most valuable non-living resources taken from the ocean. Extracting these resources requires drilling into the seafloor. Oil platforms have dozens of oil wells that are drilled in places where the ocean is sometimes 2,000 m deep. A description of the Deepwater Horizon oil spill affecting the Gulf of Mexico is located in the Human Actions and Earth's Waters chapter. The seafloor has some valuable minerals. Manganese nodules containing manganese, iron, copper, nickel, phosphate, and cobalt may be as small as a pea or as large as a basketball. Estimates are that there may be as much as 500 billion tons of nodules on the seafloor. The minerals in manganese nodules have many uses in the industrial world, but currently they are not being mined. Think back to the discussion of ore deposits in the Earth's Minerals chapter. Why do you think these seafloor resources are not being mined? Oceans are a harsh placed to live. In the intertidal zone, conditions change rapidly as water covers and uncovers the region and waves pound on the rocks. Most of the environments at sea are cold and at just about any depth below the surface the pressure is very high. Beyond the photic zone, the ocean is entirely black. Organisms have adapted to these conditions in many interesting and effective ways. The size and variety of different habitats means that the oceans are home to a large portion of all life on Earth. It's interesting to note that the smallest and largest animals on Earth live in the oceans. Marine animals breathe air or extract oxygen from the water. Some float on the surface and others dive into the ocean’s depths. There are animals that eat other animals, and plants generate food from sunlight. A few bizarre creatures break down chemicals to make food! The following section divides ocean life into seven basic groups. Plankton are organisms that cannot swim but that float along with the current. The word "plankton" comes from the Greek for wanderer. 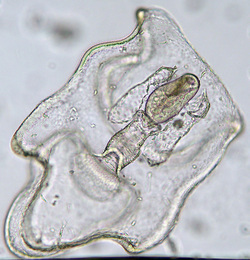 Most plankton are microscopic, but some are visible to the naked eye. Phytoplankton are tiny plants that make food by photosynthesis. Because they need sunlight, phytoplankton live in the photic zone. Phytoplankton are responsible for about half of the total primary productivity (food energy) on Earth. Like other plants, phytoplankton release oxygen as a waste product. Zooplankton, or animal plankton, eat phytoplankton as their source of food. Some zooplankton live as plankton all their lives and others are juvenile forms of animals that will attach to the bottom as adults. Some small invertebrates live as zooplankton. The few true plants found in the oceans include salt marsh grasses and mangrove trees. Although they are not true plants, large algae, which are called seaweed, also use photosynthesis to make food. Plants and seaweeds are found in the neritic zone where the light they need penetrates so that they can photosynthesize. The variety and number of invertebrates, animals without a backbone, is truly remarkable. Marine invertebrates include sea slugs, sea anemones, starfish, octopi, clams, sponges, sea worms, crabs, and lobsters. Most of these animals are found close to the shore, but they can be found throughout the ocean. Fish are vertebrates; they have a backbone. What are some of the features fish have that allows them to live in the oceans? All fish have most or all of these traits. Fins with which to move and steer. Gills for extracting oxygen from the water. A swim bladder that lets them rise and sink to different depths. Ectothermy (cold-bloodedness) so that their bodies are the same temperature as the surrounding water. Bioluminescence: light created from a chemical reaction that can attract prey or mates in the dark ocean. Included among the fish are sardines, salmon, and eels, as well as the sharks and rays (which lack swim bladders). Only a few types of reptiles live in the oceans and they live in warm water. Why are reptiles so restricted in their ability to live in the sea? Sea turtles, sea snakes, saltwater crocodiles, and marine iguana that are found only at the Galapagos Islands sum up the marine reptile groups. Sea snakes bear live young in the ocean, but turtles, crocodiles, and marine iguanas all lay their eggs on land. Many types of birds are adapted to living in the sea or on the shore. What are the common traits of mammals? Mammals are endothermic (warm-blooded) vertebrates that give birth to live young; feed them with milk; and have hair, ears, and a jaw bone with teeth. What traits might mammals have to be adapted to life in the ocean? For swimming: streamlined bodies, slippery skin or hair, fins. For warmth: Fur, fat, high metabolic rate, small surface area to volume, specialized blood system. For salinity: kidneys that excrete salt, impervious skin. The previous section briefly discussed the adaptations different types of organisms have to live in the ocean. A look at a few of the different habitats organisms live in can focus even more on these important adaptations. A great abundance of life is found in the intertidal zone. High energy waves pound the organisms that live in this zone and so they must be adapted to pounding waves and exposure to air during low tides. Hard shells protect from pounding waves and also protect against drying out when the animal is above water. Strong attachments keep the animals anchored to the rock. In a tide pool, as in the photo, what organisms are found where and what specific adaptations do they have to that zone? The mussels on the top left have hard shells for protection and to prevent drying because they are often not covered by water. The sea anemones in the lower right are more often submerged and have strong attachments but can close during low tides. Many young organisms get their start in estuaries and so they must be adapted to rapid shifts in salinity. Corals and other animals deposit calcium carbonate to create rock reefs near the shore. Coral reefs are the “rainforests of the oceans” with a tremendous amount of species diversity. Reefs can form interesting shapes in the oceans. Remember that hot spots create volcanoes on the seafloor. If these volcanoes rise above sea level to become islands, and if they occur in tropical waters, coral reefs will form on them. Since the volcanoes are cones, the reef forms in a circle around the volcano. As the volcano comes off the hot spot, the crust cools. The volcano subsides and then begins to erode away. 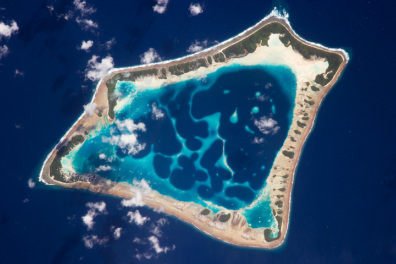 Eventually, all that is left is a reef island called an atoll. A lagoon is found inside the reef. Coral reef are near shore and so are subject to pollution from land. The coral animals are very sensitive to temperature and reefs around the world are stressed from rising ocean temperatures. The open ocean is a vast area. Food either washes down from the land or is created by photosynthesizing plankton. Zooplankton and larger animals feed on the phytoplankton and on each other. Larger animals such as whales and giant groupers may live their entire lives in the open water. The few species that live in the greatest depths are very specialized. Since it’s rare to find a meal, the fish use very little energy; they move very little, breathe slowly, have minimal bone structure and a slow metabolism. These fish are very small. To maximize the chance of getting a meal, some species may have jaws that unhinge to accept a larger fish or backward-folding teeth to keep prey from escaping. At mid-ocean ridges at hydrothermal vents, bacteria that use chemosynthesis for food energy are the base of a unique ecosystem. This ecosystem is entirely separate from the photosynthesis at the surface. Shrimp, clams, fish, and giant tube worms have been found in these extreme places.